Partizan NIS Belgrade used a dream start and a big late run to shock group leader Fenerbahce Ulker Istanbul 77-79 on Thursday and stay in the race for the Top 16 until the regular season finale last week. The victory improves Partizan's record to 3-6 in Group A, while Fenerbahce dropped to 7-2 but remains in sole possession of first place. Partizan came out on fire, making its first 11 field goal attempts, including 5 triples to build a 12-28 lead. But Fenerbahce tightened up on defense, and opened the second quarter with a 12-0 run to catch up. The hosts looked to pull away in the third quarter, when Luka Zoric and Emir Preldzic took them ahead 58-50, but Partizan bridged the third and fourth quarters with a 2-19 run to take 60-69 lead and never relinquish it. 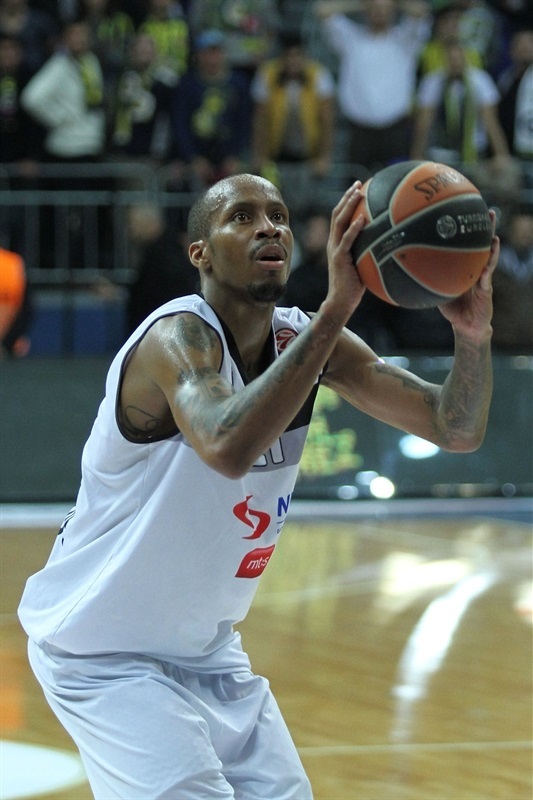 Tarence Kinsey had 20 points, 5 steals, 4 steals and 3 blocks, while Bogdan Bogdanovic netted 19 on 5-for-7 three-point shooting for Partizan. 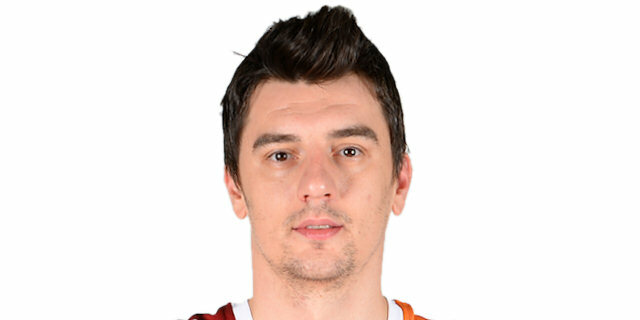 Dragan Milosavljevic and Joffrey Lauvergne scored 18 points apiece for the crucial victory. 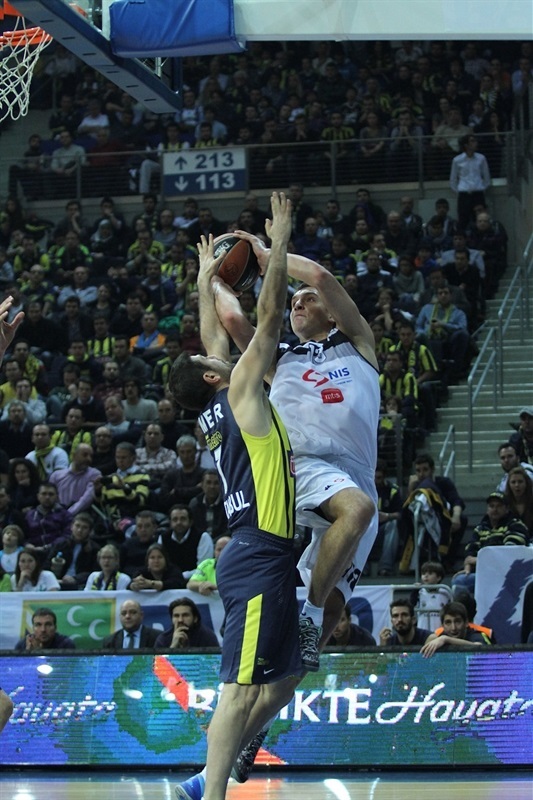 Emir Preldzic had 21 points, 7 assists and 6 rebounds for Fenerbahce. Bojan Bogdanovic and Luka Zoric each added 14, while Bo McCalebb had 11 points, 6 assists, 5 rebounds and 4 steals in defeat. Lauvergne drove for a layup-plus-free throw and Kinsey hit a long jumper to start the game. Linas Kleiza drove the baseline for a reverse layup, opening Fener's scoreboard, but Kinsey nailed another long jumper to make it 2-7. Bojan Bogdanovic eased into the paint for a layup before Milosavljevic hit a triple from the left corner for the visitors. Kleiza answered with a basket-plus-free throw, but Bogdan Bogdanovic and Milosavljeivc hit back-to-back threes to put Partizan up 7-16. Not much changed after a timeout by Fenerbahce head coach Zeljko Obradovic. Lauvergne detonated a dunk in traffic before Nikola Milutinov had a block that led to Kinsey's fastbreak layup and a 7-20 scoreboard. An alley-oop dunk by Gasper Vidmar snapped Partizan's 0-10 run, but Kinsey and Milosavljevic answered with triples to make it 9-26. Bojan Bogdanovic then hit the first three-pointer for the hosts, but Kinsey scored again, giving Partizan a perfect 11-for-11 start from the floor and a 12-28 lead. Kinsey missed a triple on the next possession, Partizan's only miss in the first quarter, before Nemanja Bjelica scored from behind the arc for Fenerbahce. But Bogdan Bogdanovic's driving layup closed the first quarter with Partizan ahead 17-30. It was a whole different type of a game in the second quarter as Fener held the visitors without a single point for more than 5 minutes. A couple of fastbreaks, a layup from Melih Mahmutoglu and a dunk from Zoric started the hosts' run. Then, Zoric drove the baseline for a layup, before McCalebb and Bojan Bogdanovic each finished fastbreaks with dunks to make it 28-30. Milosavljevic snapped Fenerbahce's 12-0 spurt with a shot from mid-range, but Preldzic hit from mid-range, too, for the hosts. Milutinov gave Partizan some breathing room with a put-back and Lauvergne with a dunk, before McCalebb and Bogdan Bogdanovic traded shots from downtown for a 35-39 scoreboard. Bjelica finshed the quarter with a layup, getting Fenerbahce within 37-39 at halftime. 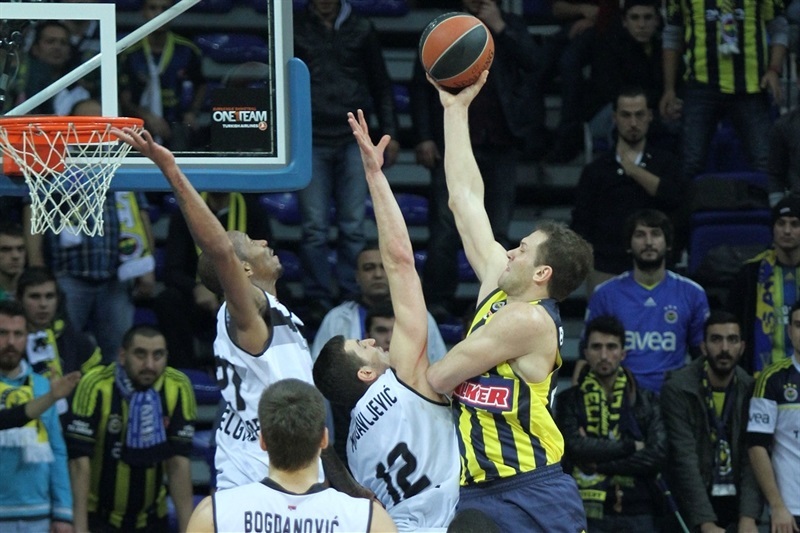 Bojan Bogdanovic scored from downtown for Fenerbahce's first lead to open the second half. 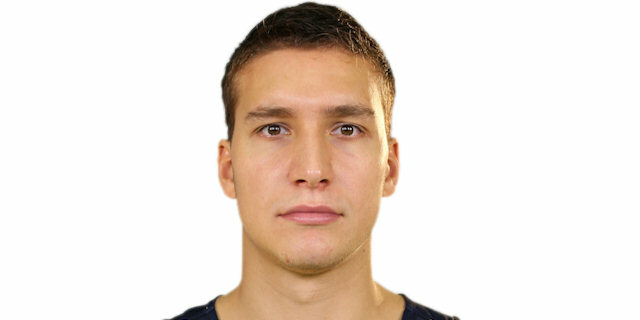 Bogdan Bogdanovic answered right back for Partizan, however, with his own three-pointer. After Zoric scored from close range, Preldzic hit from deep and then drove to the hoop for a 47-42 Fenerbahce advantage After a timeout, Milosavljevic buried a three pointer, and after McCalebb drove for a layup, Lauvergne made a basket-plus-free throw at 49-48. But as quickly as Partizan threatened, Zoric strung together three baskets and Preldzic converted a three-point play to keep Fenerbahce safe at 58-50. However, Partizan was not going away. 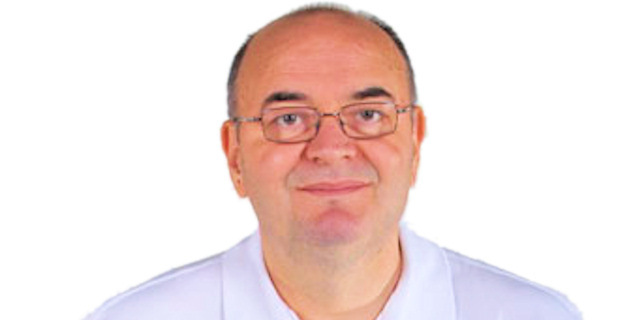 Bogdan Bogdanovic hit a long two-pointer and followed it with a long three-pointer before Lauvergne's jumper, with his toes on a three-point line, cut the difference 58-57. After a timeout, Lauvergne banked in a floater for as Partizan briefly regained the lead, but Preldzic's free throws took it back for Fenerbahce at 60-59 after 30 minutes. Bogdan Bogdanovic buried another long three-pointer to start the fourth quarter. After Kinsey also sank one of his own and Lauvergne added a long jumper and a monster dunk, the visitors were suddenly in charge, 60-69. McCalebb ended Fener’s scoreless drought of almost 5 minutes with a fastbreak layup, and Zoric scored on a breakaway at 64-69. Partizan struggled to respond until Milosavljevic finished a fastbreak layup and Kinsey followed with a steal-and-dunk combination to make it 64-73. 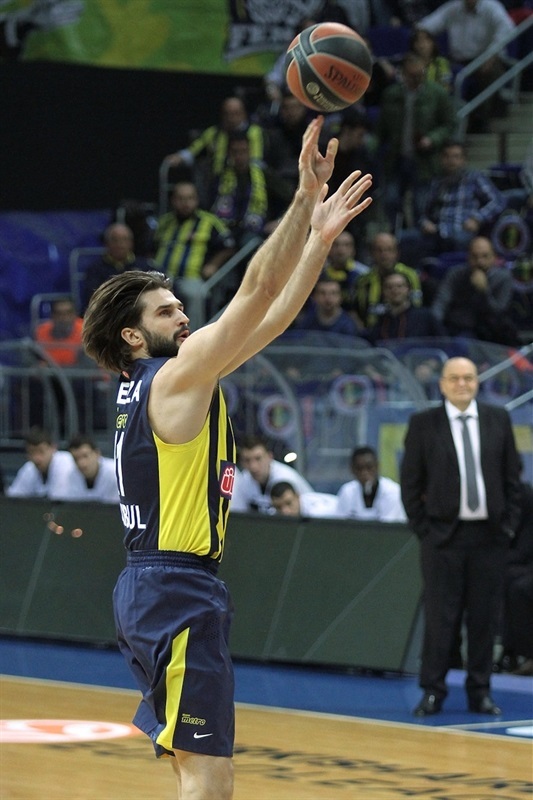 Preldzic nailed a three-pointer for Fener, but Dejan Musli answered with a layup, his only points of the night, at 67-75. Bojan Bogdanovic made a pair of free throws and McCalebb raced for a fastbreak layup with 60 seconds to go. On the ensuing possession, the hosts forced Partizan into a 24-second violation, and McCalebb split a pair of free throws to get Fener within 72-75 with 26 seconds to go. 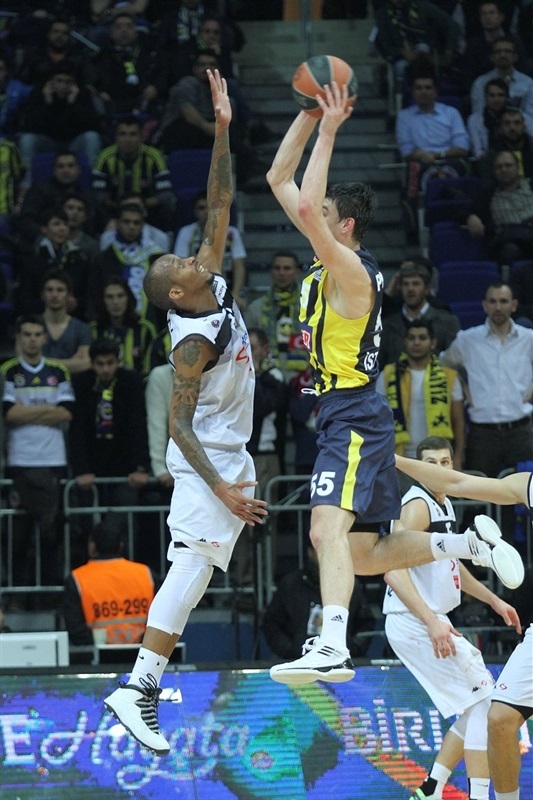 Kinsey and Preldzic traded a pair of free throws, before Fenerbahce stole the ball for the final possession. But Preldzic and Bjelica missed potential game-tying three-pointers and Kinsey sealed it from the foul line. Bjelica closed out the scoring with a long triple at the buzzer, but Partizan already had the outcome it needed to live to fight another day. "Congratulations to Partizan NIS. They played for their heart and winning the game. We started the game very bad and conceded 30 points just in the first quarter. Our opponent did things well even when we were good in defense. We had a chance to win the game. But they challenged and remained resistant with their heart. Anyway, I’m satisfied with my players. We fought to come back and win the game. I also want to thank our fans. They are always supporting us even if we fail. If we can beat Nanterre on the road, we will finish on top of the group. I’m not sure if it’s an important thing. Whoever we play against, it will be difficult in the Top 16. But we will be ready to handle it." "We are really very happy to beat a strong opponent like Fenerbahce Ulker. They are a magnificent team that has talent in all aspects. 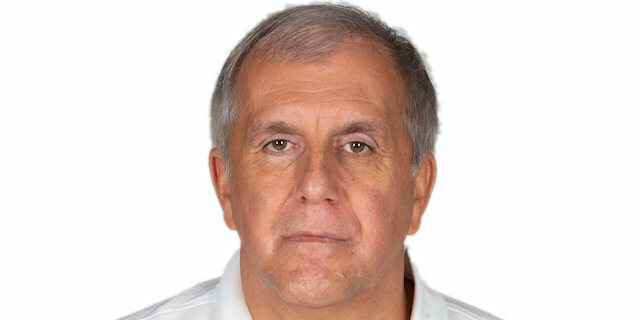 Zeljko Obradovic has many good players. And Fenerbahce Ulker has a great coach who has won everything around Europe. Every game is important in the Euroleague, but this one is really special regarding the situation to reach the Top 16. I’m grateful to my players for their great effort and heart. They showed excellent quality in the game." "It was a terrible start for us. After falling behind 17 points in the first quarter, we managed to come back and lead the game in the middle of the third quarter. But then they had another big run that we couldn’t answer again. They really shot superb all game. We did everything to win, but they were unstoppable tonight. We will try to win our last game against Nanterre to finish the group on top." "It was a very important game which we needed to win to stay alive for the next stage. I think we played our best game of the season. We shot very well with great motivation. It feels perfect to beat a team like Fenerbahce Ulker. I hope we repeat the same way against CSKA Moscow."